When the ISA confirmed the SUP Worlds were going to take place in Fiji (Nov 12-20) everyone picked to represent their country took a collective gasp, pinched themselves and re-read the announcement. Paddling in paradisaical bliss, with only your fellow competitors in the water, what could be better? Following the news reality then bit. It’s all very well being on the team but then the hard slog of financing the trip starts. As part of Team GB Alex Murray is on that path and hoping to be among the action in Fiji. We hit Alex up to get the goss from the Cornish ripper and see how things have been going. When did you discover stand up paddle and what made you get involved? 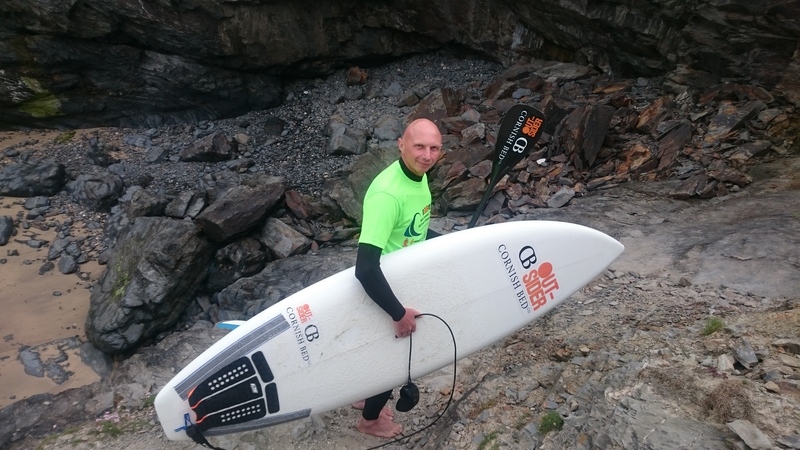 I had my first try in 2006 when UK SUP pioneer Olaus McLeod brought a 12’1” Laird Surftech down to Polzeath for the Escape team to try. After catching my first wave I was instantly hooked. We then got to work in the factory building our first board and paddle soon afterwards. Have waves always appealed or do you enjoy flat water SUP also? 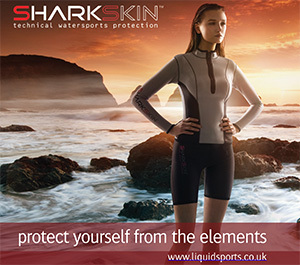 I have always been passionate about surfing, since starting at the age of twelve. But I do love flat water exploring and cruising when the sun is out. What’s your local put in like in and why’s it special? Polzeath is my main SUP spot. It’s mostly a fat longboard style wave, but with usually fairly long rides, for a beach break. Perfect for stand up! How about abroad – any favourite stand up spots you can mention? Soon to be Cloudbreak in Fiji, I hope. Tell us about the SUP scene in your neighbourhood – is stand up getting more popular or could more work be done to attract newbies? So far it definitely feels like more people are doing it this summer, especially when it’s small. Also there is a lot happening on the estuary (Camel) with the surf schools. Do you work with any clubs or SUP schools to help boost participation levels? Not at the moment. I had a school in the early days but found the lugging and storage of heavy boards a pain. It must be much easier now with blow ups. Talk us through your competitive SUP career to date – what have been the highs and lows? I competed in John Hibbard’s 2007 September Sessions back at the beginning of SUP competition in this country – which was still the most fun event I’ve been part of. It had surf and race together with such a great atmosphere. The low point sadly has to be the last BSUPA comp at Gwithian. Great venue, weather and people, but literally no waves. 18cm would have been stretching it, never mind the BSUPA competition minimum of 18 inches. How far do you plan on taking it – will Fiji be enough or do you have your sights set on further global events? I really can’t think beyond Fiji at the moment. 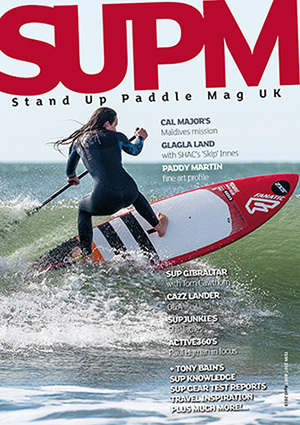 Give us your opinion on UK SUP surfing as a whole – do you think we can mix it up on the world stage? It will be interesting to see how well we do in real waves. Matt (Barker-Smith) and Aaron (Rowe) have given strong performances in the past and it looks like Ollie (Laddiman) and Blue (Ewer) are going to be pushing it in the future. It’s just a shame there aren’t more young guys coming up through the ranks. What are you most looking forward to about the World Champs in Fiji? How do you think you’ll perform – any anxieties yet or will that be later? Until we know which spot we will be competing at I can’t say. The ISA still haven’t given out details on where the event will be yet. Hopefully it will be announced soon. But whereever it is I will give it my all. Tell us about the kit you’re currently using and how, if any, this’ll differ from the set up you’ll be heading to Fiji with. At Escape I am constantly experimenting, shaping and testing new boards. Latest is a 7’6” X 26 ¼” squash tail thruster. I will probably take something like this and a 7’8”- 7’10” for when it gets bigger. Again I can’t really say fully until I know what spot we will compete at. Are you doing any specific training in preparation for the event? If so run us through your regime. Just surfing as much as possible at the moment. I will move on to full training towards the end of summer. What about diet? Anything you’ve added and/or removed? Not planning to change much, I usually eat quite healthy food. I’m a veggie but eat fish. But I will try to go easy on the booze. I have got a few big party’s coming up though so it’s going to be hard. If so what was the motivation behind the above? I became a veggie in my late teens. I went over to the dark side after experiencing too many Moroccan meat markets whilst travelling there one winter. You’re known as a surfer but do you have any desire to get involved in SUP racing? I did a few races in the early days but it’s not really my thing. I enjoy watching though and will be fully supporting Team GB out in Fiji. 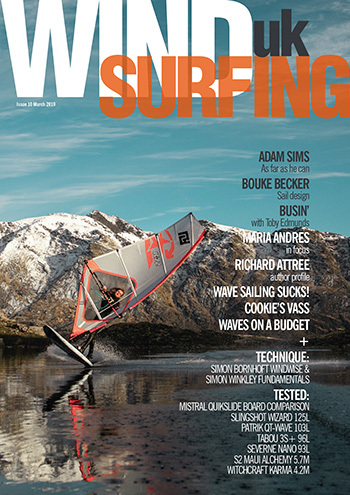 I do, however, like the idea of doing downwind foil racing, that could be really fun. What about other areas of SUP – anything on the Alex Murray bucket list outside of SUP surfing you want to get ticked off? I would love to get my children SUPing in waves. I’m also very keen to give foil boarding a go and I really want to try some white water river stuff too. Talk us through your sponsorship drive to get to Fiji. What are you doing to raise funds for the trip? Are you finding it tricky? It has been hard work for sure. I have written a lot of letters to surf companies and spent far too much time on the Internet. But most of my success has been through help from friends and family. So far I am really pleased to have two great sponsors in place: Outsider (a TV production company) and the Cornish Bed Company. It would be really great if they could follow me on social media. I have a Facebook sports page and I am alexmurraysurf on Instagram. Any final shouts and thanks? Yes, massive thanks to my amazing family and friends, who have been fantastic at helping me with raising funds to get to Fiji. Big thanks also to: Outsider, Cornish Bed.co and Escape Surfboards.